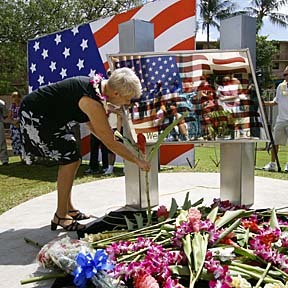 A stainless steel memorial honoring the victims of the terror attacks of Sept. 11, 2001, and their families was unveiled yesterday at Honolulu Community College. At the ceremony, Former HCC and UH student Christine Snyder, who died in the plane that crashed in Pennsylvania, was honored at the ceremony. Above, Christine's mother, Jan Snyder, placed a flower in front of the memorial. The memorial was built by HCC sheet metal and plastics instructor Danny Aiu.